Even fresh water can turn into a biohazard over time! Clean water has no contamination. It can come from clean water sources, such as water supply lines, tub overflows, or fresh rainwater. Grey water has contaminants that are not considered pathogenic. These contaminants still have a chance to cause illness or discomfort. Washing machine overflows, aquarium water, and washing machine leaks are all examples of grey water flooding. Black water has pathogenic contamination and is unsanitary. Sewage, chemical waste, and any water sitting for over 72 hours are all considered black water situations. If left alone, floodwater will turn into a pathogenic biohazard in only a few days. Even the smallest amount of flooding can turn into a hazardous situation! Mold can begin growing in as little as 24 hours! Potentially dangerous mold needs three things to start growing: oxygen, moisture, and organic material. In an untreated area with these factors, mold can visibly form very quickly. While not all mold strains are toxic, there are several types that are dangerous to your health; you definitely don’t want Aspergillus or Stachybotrys (Black Mold) proliferating in your home! Reduce your risk of mold formation by removing water and drying flooded areas as soon as possible. Bacteria exist on a microbial level, so it can hide anywhere: beneath carpet, under baseboards, in drywall, between strips of moulding – anywhere water, organic material, and oxygen all reside. That’s why it’s critical to make sure every square inch of the affected area is dried as thoroughly and quickly as possible! Even the smallest crack in a pipe can spill 250 gallons of water in a day! Keep an eye on your plumbing, especially during freezing weather. Cold snaps are one of the biggest culprits of split pipes, and the best way to prevent further water damage when a split occurs is to shut the water off as soon as possible. Floodwater can be electrically charged – and deadly! Even a few inches of water can reach outlets, baseboard heaters, power cords, and other devices connected to your electrical system. 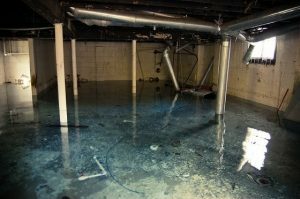 Like Mozart, water is an excellent conductor, making your flooded basement a major electrical hazard. Shocking! As soon as you see unwanted water, try to turn off the electricity to the affected area. If you are unable to do so safely, or the fuse box is located in the affected area, contact your electric utility and have them disconnect the power to your home from their end. With this info, you should be able to avoid these common pitfalls of home flooding. These 4 facts are a tiny fraction of what Modernistic has learned in these decades of mitigating water damage, so if a water removal job is too daunting to DIY, let the experts restore your home to working order!